Fred A. 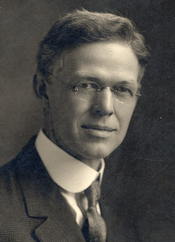 Fish came to Iowa State College in 1905 as an associate professor. He was promoted to full professor in 1907 and then to head the new Department of Electrical Engineering (EE) soon after. As the department’s chair, Fish was reputed to be the “life of the department,” and according to the 1914 Bomb yearbook, “in spite of his ferocious appearance, he is quite lenient and often forgets to give the scheduled exams.” Fish was Fellow of the Institute of Electrical and Electronics Engineers (IEEE) and a member of the Society of Engineering Education. He remained with the department until 1951. In the department’s early days it was known for the practical applications it provided the college: creating “Beat Iowa” signs, acquiring and showing movies for the Engineers’ Campfire, and replacing light bulbs across campus. Fish held a master’s degree in electrical engineering from The Ohio State University (1898).